This week I tried out lipstick from a brand I have never used before for cosmetics- The Body Shop. I have heard really great things about their makeup brushes, but I was not too sure of their cosmetics. As the store was having a 50% sale on all cosmetics, I decided to pop in and check out what they offer. Immediately I saw the lipstick section and decided to spend my attention there, as lipstick is usually really expensive when it comes to cosmetics, so 50% off would be a great deal. After going through a few swatches, I fell upon a beautiful red lipstick, which also happens to be my colour of weakness. Really, I have so many red lipsticks I am beginning to lose count. But keep in mind, I don't just buy any red lipstick I see, I make sure that I purchase the best shade that compliments my complexion. Plus, I feel like red is such a great colour that compliments everyone. The lipstick colour I picked up from The Body Shop is from their Color Crush line and is called Enraptured Red (code 115). The color is very bright and vibrant and leaves a nice sheen on the lips, as shown in the picture below. 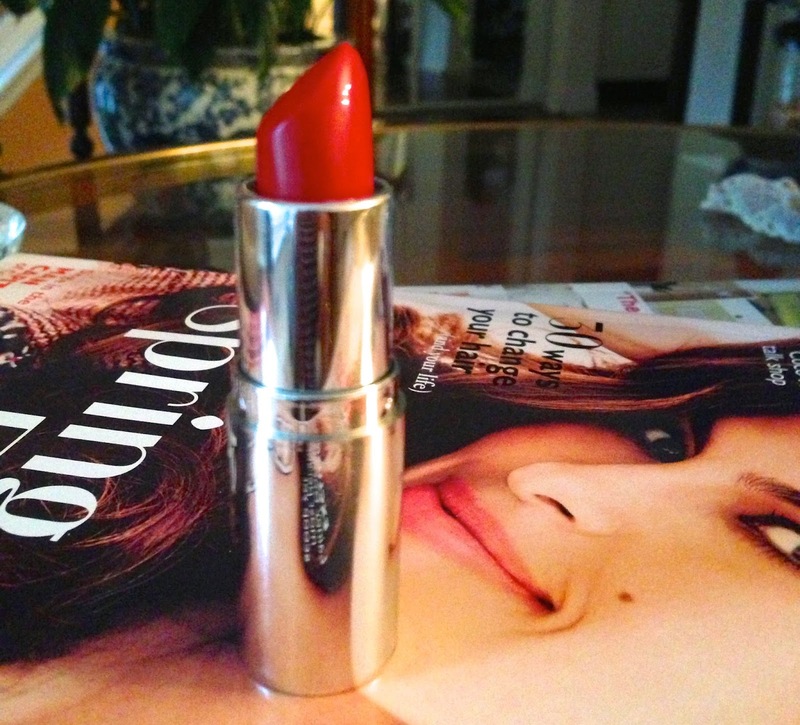 The lipstick has a skin conditioning agent, which keeps lips feeling very soft and moisturized. I also liked that the lipstick has a long staying power which is a quality I love in lipstick, especially because I am a big coffee drinker. Tip: If you apply lip liner before the lipstick, it will prevent the lipstick from bleeding outside of your lip. As well, if you pencil in your lip with lip liner before you apply lipstick, it will help the lipstick to last longer. Also, this lipstick is very affordable at $13.00 (before the discount), which is a good price for a quality lipstick that is not sold at a drugstore. If you are on a budget, I would recommend checking out the lipsticks offered at The Body Shop as you may find some great dupes of some of the expensive brands offered. Overall, I really like this lipstick as it provides a nice pop of colour to my lips, while leaving them feeling hydrated which will come in handy as the weather gets colder in the next couple of months. Feel free to leave a comment below and don't forget to subscribe or Follow my blog with Bloglovin!